Millions of people across borders, classes and cultures have modified their bodies using ink. While many are fascinated by tattoos for their aesthetic value, their graphic history reveals how they have acted as a means of suppression and exclusion but also as a form of resistance to restrictive social codes. France is a colourful case study showing how attitudes towards tattoos have changed across the centuries. From the 16th century onwards, French voyagers encountered people with different kinds of bodily practices to theirs in places from the South Pacific to the Americas. Such people were, in the eyes of some French observers, “primitive” outsiders to “civilisation”, and their tattoos only contributed to this perception. Others – notably sailors – were inspired by what they saw, and got busy with the ink. By the turn of the 19th century, the “tattoo” had a common name in Europe as tatouages, Tätowiren, or tattoos. 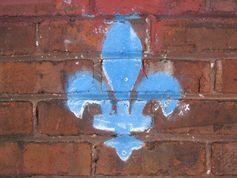 Fleur-de-lys: a mark of state property. In 19th-century France, authorities began to use the tattoo to mark a different kind of “outsider”: the criminal. The hot iron which had branded early-modern French criminals was replaced by the more discreet weapon of the tattooist’s needle in 1832. Instead of a generic fleur-de-lys, criminals were marked with an individual code to identify them. The tattoo was a visual marker of the criminal’s submission to legal authority. But it was also a form of physical violation. In Christian religious culture, bodily markings had often been condemned as evidence of paganism as Jane Caplan has pointed out. When the needle penetrated the convict’s skin, it symbolically took away what remained of their body’s sanctity. The hot iron brand punished the body, but the tattoo punished the soul. When convicts took to inking themselves, though, they appropriated the tattoo. The prevalence of tattoos on men in the French overseas penal colonies and in military prisons contributed to their association with deviancy in the late 19th century. 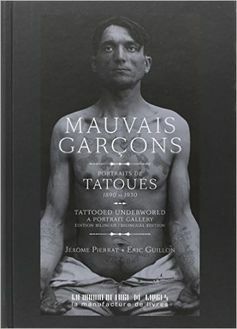 Mauvais garçons: Portraits de tatoués (1890-1930) by Pierrat and Guillon. In a photographic essay, Jérome Pierrat and Eric Guillaume demonstrated how the tattoo became a striking means of rebellion against “respectable” society by the mauvais garçons of the fin-de-siècle French underworld. For some, these tattooed “bad boys” had a certain exotic allure – see the popularity of Edith Piaf’s tattooed Legionnaire, or Papillon, the fanciful “memoir” of ex-convict Henri Charrière published in 1969. In the book, the protagonist’s nickname comes from the butterfly – the papillon – tattooed on his chest: an emblem of hope and freedom as he tries to escape prison. Since then, individuals and groups have continued to choose needles and ink as tools with which to court outrage at the same time as expressing themselves artistically. Tattoos can stake a claim on their bearer’s sense of communal belonging as well as their individuality. People use them to build communities of all kinds, from military regiments to biker gangs. Tattoos also convey something about the “edge” between oneself and the rest of the world. For some, they are associated with inner mystery and darkness brought to the surface, representing (in the words of Juliet Fleming), “an inner demon at once expelled and held at the border of the subject”. This interpretation seems apt in light of the recent Semicolon Project in Anglophone countries, where a tattooed semi-colon has become a symbol for solidarity with those who suffer from depression and suicidal thoughts. Some commentators perceive the campaign as a fleeting trend which, spread by hashtags, does little to promote autonomy among those it reaches. Others are wary of an agenda associated with religion. Project Semicolon has gone viral among Twitter users, but it is far from superficial. Like many of their tattooed predecessors, participants take something which might have originally marked “outsider” status – in this case, mental health difficulties – and have turned it instead into a symbol of inclusivity, communication and creativity. The semi-colon is at the same time a self-chosen “branding” and a collective statement of hope. As the French case demonstrates, the tattoo is firmly inscribed within the cultural history of the modern era. These days, tattoos play an important social role by challenging our notions of beauty and belonging. Perhaps we might best understand tattoos as visible (and tangible) demonstrations on a body which so many outside forces seek to discipline and control. Hey Buddy!, I found this information for you: "From punishment to protest: a French history of tattoos". Here is the website link: https://www.reversatatt.com/2016/12/punishment-protest-french-history-tattoos/. Thank you.